The decision to take a preparation course for the LSAT is often a difficult one for potential test takers. After all, $395 to $1,295 is a considerable amount of money to spend, especially for the mere possibility of gaining ten to twelve points on a single test. There is, however, an underlying investment in your test preparation efforts. The following chart lists various LSAT scores from 145 to 170 and the corresponding schools that admitted approximately fifty percent (50%) of applicants with those scores. When graduates from these represented schools are analyzed post-graduation in terms of starting salary and likelihood of securing gainful employment, the LSAT score paints an incredibly accurate picture of what graduates entering the private sector can expect to earn, as well as the unemployment rate those students will find themselves facing at graduation. Data as given under ** and *** below is based upon graduates responding to surveys by both the Law School Admission Council and by the individual law schools, and, therefore, likely does not represent 100% of graduates from a particular institution. * The average LSATs used are those that fall well within the 25% - 75% range for past years' acceptance for that particular school. ** Salaries listed are the midrange of full-time private sector (representing employment in either a law firm or in business/industry) salaries for graduates. Private sector employment is typically understood to represent the highest salaries graduates receive when compared to graduates employed in academia, government, judicial clerkships, etc. *** "Unemployment" represents graduates seeking employment yet still unemployed six (6) months after graduation (please note that these numbers are not a complete percentage of all unemployed graduates, as some pursue further degrees and some do not seek immediate employment). It should be immediately clear that even a five-point increase in your LSAT score can ultimately produce a huge difference in your starting salary upon graduation. Most notably, the five-point differential between an LSAT score of 155 and 160 results in an average salary increase of $33,924.50 (155: $53,556.50; 160: $87,481.00) for the first year of employment. When considering an LSAT preparation course such as those offered by PowerScore, you should be aware that increases greater than five points are commonplace. In fact, students have seen their scores improve by ten, fifteen, even twenty points or more, resulting in a tremendous increase in their potential salary based on the law of averages represented in the chart above. To hear what some students had to say about their PowerScore experience, read these Student Comments. The importance of LSAT preparation is further increased by that fact that, for the vast majority of law school applicants, their GPA is already established. The LSAT, then, is one of the few real determining factors that the student can affect. A second trend of increasing LSAT scores is, on average, an increasing level of employment. The statistics given here represent graduates from particular colleges who actively seek employment and are unable to find it for at least six months. Actual unemployment figures for the universities listed above are slightly higher, as some students pursue further degrees and others do not seek immediate employment upon graduation, but the important percentage to consider is that of graduates unable to find employment they deem appropriate. When evaluating salaries, you should remember that these are typically considered high-end salaries, that is, starting salaries from the private sector are, on average, higher than those of the public sector (the public sector includes government employment, judicial clerkships, academic employment, etc.). While the majority of students are employed in private sector areas upon graduation, average salaries for all graduates are going to be slightly lower for each school listed. Also, the salaries here are only for the first year of employment. In other words, the nearly $34,000 separating the starting salaries for a 155 and 160 very likely applies to the years that follow the first year of employment. So, assuming constant pay rates, after three years that five point LSAT difference is worth over $100,000! It should be clear from the information above that even a seemingly small improvement in your LSAT score can open doors to a future you may have never considered possible. While there is no guarantee that a particular score, or even enrollment in one of the schools listed, will result in a salary that falls in the given range, a vast number of test takers (and, eventually, law school graduates) will find themselves with the opportunity to earn an amount that corresponds with their initial LSAT results. That said, do not gamble with your financial future when an opportunity to help secure it is well within reach. 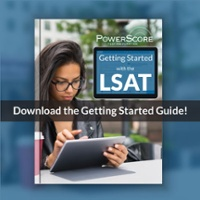 Enroll in a PowerScore LSAT Course.